Interested in a meeting space for your group or event? Give us a call at (828)524-3600 to reserve a room! The Library's meeting room is a suitable space for up to 154 people or 60 people with seating. It includes an LCD projector with a 10'x10' projector screen. The AV system in the meeting room allows you to connect a multitude of devices and you can configure setup with the touch screen. The meeting room can be reserved 45 days in advance. The Library's program room is suitable for 30 people. It includes a 42" flat panel display. The AV system in the program room allows you to connect your device to displays presentations, slideshows, or movies. The program room can be reserved 45 days in advance. 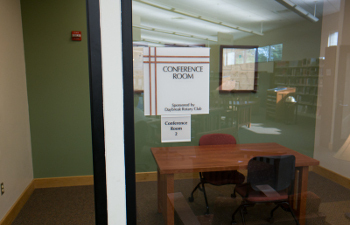 We have four conference rooms available: two in the reference area and two in the youth services area. Each room seats four to six comfortably. Rooms are on a first come first served basis. You can reserve a conference room a week in advance. Conference rooms are in high demand, so reservations will be held for up to 15 minutes before being given to another party. We have four tutor rooms available: two in the reference area and two in the youth services area. Each room can seat one or two people. Rooms are on a first come first served basis. 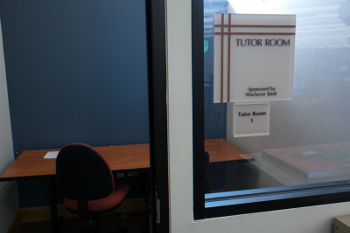 You can reserve a tutor room a week in advance. Tutor rooms are in high demand, so reservations will be held for up to 15 minutes before being given to another party. Macon County Public Library has plenty of public space to be used. Many chairs and tables are spread throughout the building. Outlets are readily accessible for plugging in your mobile device.